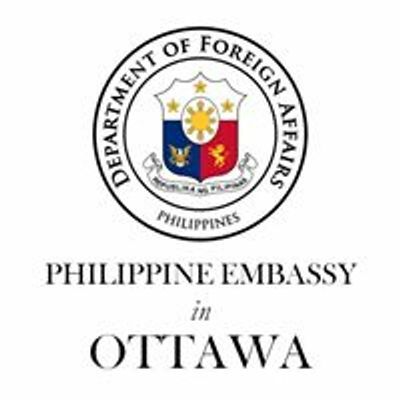 The Embassy of the Philippines in Canada will host “Postcards Across the Pacific,” a two-week exhibit at Sentro Rizal Ottawa scheduled from 19 March to 2 April 2019. The exhibit features the works of six Filipino and Canadian artists as they explore life in Canada as first and second generation migrants. Kristina Corre, Archy Cruzado, Christienne Cuevas, Christiane Mayo, Teresa Rozkiewicz, and Joejene Santos delve into themes of cultural identity and the migrant experience, sharing their insights and exceptional styles. “Postcards across the Pacific” will officially open the year-long celebration of the 70th Anniversary of Philippines – Canada Relations. First established through a trade mission in 1949, Philippines – Canada bilateral relations have since expanded to cover broader areas in other economic, political, and cultural affairs. Over the decades, Canadians and Filipinos have traveled across the Pacific to discover new horizons. Many have chosen to remain in their adopted country, further deepening people-to-people friendships and serving as bridges between the Philippines and Canada. This exhibit seeks to explore this journey and give voice to some of the issues faced by different generations of Canadian migrants, of which Filipinos now comprise a significant number. Recognized as one of Canada’s visible minorities, Canadians of Filipino heritage may be found from coast to coast to coast. Their presence is tightly woven into the rich fabric of Canadian life, contributing their own unique character to Canada’s rich multicultural milieu. Sentro Rizal Ottawa was established in 10 May 2018 pursuant to Philippine Republic Act No. 10066 (National Cultural Heritage Act of 2009) Section 42 mandating the creation and establishment of Sentro Rizal for the purpose of promoting Philippine arts, culture, and language throughout the world. Sentro Rizal Ottawa hosts a Filipiniana library, including a “Virtual Sentro Rizal,” and is open to the public. Kristina Corre is a Filipina-Canadian artist whose meditative collage works explore cultural and personal identity. As a life-long imaginer of new worlds, she earned her Bachelor of Architectural Studies and Master of Architecture degrees from the Azrieli School of Architecture and Urbanism at Carleton University. Beyond the history, theory, and practice of architecture, Kristina’s education instilled in her a meticulousness in her craft, a love of materiality, and the importance of narrative in image-making. These three paramount lessons combined with her explorations into the social, aesthetic, and artistic unpacking of what it means to take up space currently drive her practice of hand-cut, minimalist found-image and object collage. Kristina is represented by commercial art gallery Studio Sixty Six in Ottawa. In 2018, Kristina received a grant from the City of Ottawa for her Arrivants project – an exploration of migration stories and experiences of Filipinos in Ottawa. For more information (or to participate in the project), visit arrivantsproject.ca. Archimedes Cruzado is a Visual Artist who brings his ideas to life through Photo Realism. Most of his artworks utilize strong highlights, creating a special effect that invites viewers into the scene. Archy was born in Manila, Philippines and was raised in Tuy, Batangas. He studied at PWU Institute of Fine Arts and Design and finished Painting. He represented PWU in numerous art competitions, garnering awards such as Second Prize at the David Bowie International Art Competition (National Level) and Grand Prize at 10th World Youth Day “Pope John Paul II, Christ Messenger to the Youth National Students Painting Competition.” He has done various group shows with different art groups in the Philippines and in Canada where he migrated in 1998. Christienne is a contemporary artist. She holds a BA in Psychology, Professional Writing and Communication from the University of Toronto and a BEd from York University. Christienne's influences range from Annigoni to Sorolla to Rembrandt van Rijn. Christienne is currently working from Toronto, Canada. Her works are held in private collections in the US, Canada, and Europe. Christiane was born in Athens, Greece in 1995 to two Filipino diplomat parents. She has lived in Greece, the Philippines, Hong Kong, Sweden, and Canada. As a child, Christiane used art to evoke her imagination, to “make things pretty,” and through her adolescence until present, she has used art to connect to the world and with people. One thing that the viewer will notice in Christiane’s work is the variety of color she utilizes, because, as she says, “life needs more color.” Christiane is inspired by artists such as Egon Schiele, Gustav Klimt, Van Gogh, Darren Butcher, and Denis Sarazhin. 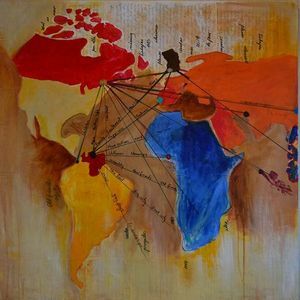 Now that she has completed her degree in Political Science at the University of Ottawa, she hopes to continue honing her art skills and finding her voice in art. 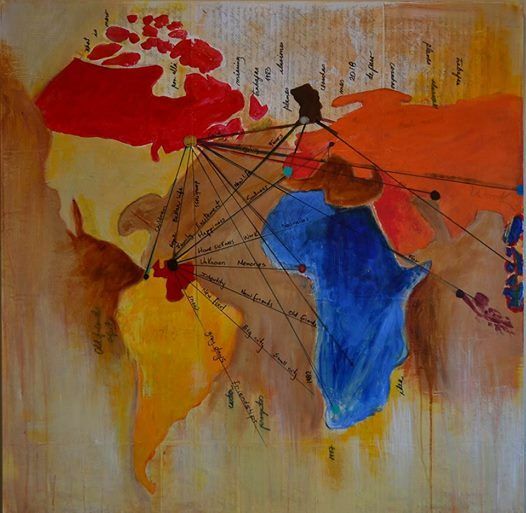 Teresa is a Venezuelan-Canadian artist. Although she has a Master in International Relations from France and worked in development in Venezuela and Canada, her true passion, art, started during her university years and blossomed when she first lived in Japan. Her time spent there in the mid-nineties allowed her to experience the essence of the Japanese aesthetic and changed her life. Her pieces are structured in a series of layers and read through texture. The artist’s work includes multiple layers of paint through which images appear tracing back in her memory. The washi paper, metal, photography and recycled everyday objects she uses give richness to her works, which are often reinforced with a photographic or text narrative. Teresa’s paintings are in private collections around the world. Born in 1970, Joejene moved to Canada from the Philippines in 2006 and is currently based in Ottawa, Ontario. He earned his Bachelor’s Degree in Fine Arts at the Philippine Women’s University in 1996. As a student, he was actively involved in different visual arts groups and participated in various art exhibitions which further developed his passion as an artist. He held different artist roles including art instructor, children’s art workshop facilitator, graphic artist, book illustrator and theme park designer. These jobs brought him to different places in the Philippines and the Middle East before he came to Canada. His work is currently represented in Ottawa at the Orange Art Gallery and held in private art collections in Philippines, Canada, United States, and Italy.